PEGASEM Wheel Speed Sensors offer high precision information as to the rotational speed of the car wheels, they can also be used as precise vehicle speed and distance transducers. For testing of tyres and Antilock Braking Systems (ABS), they give exact information as to the status of the wheels for slip and skid calculations. 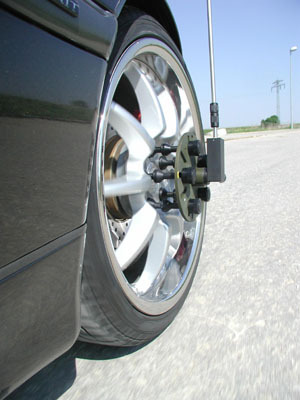 Our Wheel Speed Sensors have been designed for harsh environments typical of tests on a car wheel hub. They resist shock, vibration, dust, mud, salt-water, snow and ice without problems. They fit seamlessly with the PEGASEM Modular Mounting System and can quickly be attached to a wide range of different wheels and hubs. The three different versions of this series of sensor meet various needs in the vehicle testing business. They are available with pulse output, analogue speed and/or serial data output and calibration capabilities.